In two vignettes, respondents were asked if and when the social media platforms where the incidents were occurring should have stepped in and addressed the unfolding events. Again, majorities agree that the platforms should step in to address behaviors such as threatening messages. But public views are more split when it comes to the responsibilities of the platforms at other points in these incidents. The vast majority of Americans (89%) agree that David does experience online harassment at some point in this conflict. Just 4% feel that he does not experience online harassment at least somewhere during the episode, and 7% say they are not sure if he was harassed or not. Although there are some modest demographic differences on this question, sizable majorities of Americans across a wide range of groups agree that this scenario as a whole does in fact involve online harassment. When asked to identify which specific elements of the scenario they consider online harassment, only a small share of Americans (5%) think the initial disagreement when David offends his friend qualifies. 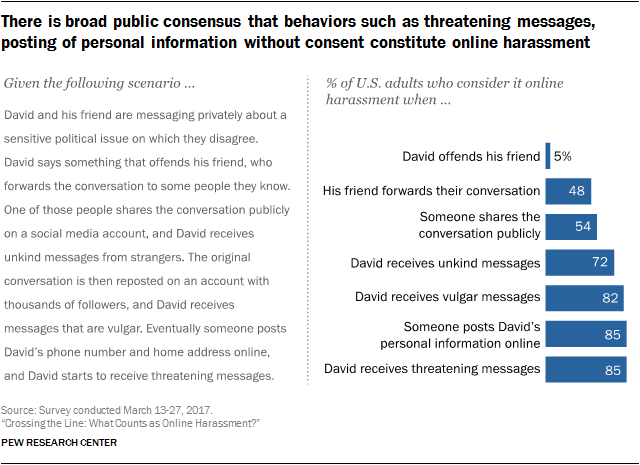 The public is more evenly divided on the next two elements of the scenario: 48% think it constitutes online harassment when David’s friend forwards their private conversation to other people, while 52% do not deem it harassment. Similarly, 54% say it counts as harassment when someone then shares the conversation publicly on social media, while 46% think it does not. There is relatively broad consensus on the remaining elements of the scenario. Substantial shares of Americans think David experiences online harassment when he begins to receive unkind messages from strangers (72%), when those messages become vulgar (82%), when his personal information is posted online (85%), and when he starts to receive threatening messages (85%). The gender of the scenario’s lead character has little impact on Americans’ perceptions of whether online harassment did or did not occur in this situation. A separate group of respondents was given an identical scenario to consider but with a woman as the lead character instead of a man. Some 91% of Americans feel that the scenario involving a female protagonist qualifies as online harassment, compared with 89% in the scenario involving a man. And their responses to the specific elements of the story are also nearly identical in each version. As was true in the preceding scenario, the vast majority of Americans (89%) agree that Julie does indeed experience online harassment at some point in this scenario. Another 6% feel that Julie was not harassed at any point in the encounter, while 5% say they are unsure if this scenario involves harassment or not. And as was the case in the preceding scenario, the public has differing views on which aspects of this story represent online harassment. 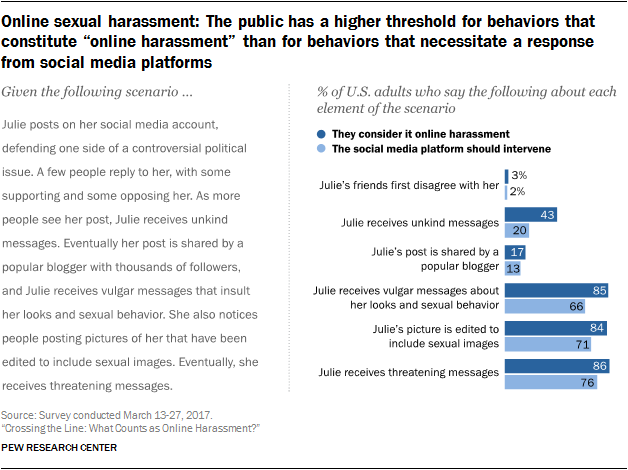 A very small share of Americans (3%) think Julie’s initial disagreement with her friends counts as online harassment. Some 43% consider it harassment when she begins to receive unkind messages, while around one-in-five (17%) consider it harassment when her post is shared by the popular blogger with thousands of followers. Meanwhile, substantial majorities of Americans think Julie is being harassed when she receives vulgar messages about her looks and sexual behavior (85%), when her picture is edited to include sexual images (84%), and when she receives threatening messages (85%). Along with asking respondents to identify which specific elements of this scenario count as online harassment, this scenario included a second set of questions about when – if it all – people think the social media service where this incident was occurring should have stepped in to address the behaviors in question. These findings indicate that the public has a somewhat different standard for behaviors that constitute online harassment, as opposed to behaviors that necessitate a response from online platforms. For example, some 43% of Americans consider it to be online harassment when Julie receives unkind messages from the people reading her post – but just 20% think that the platform should have stepped in to address that behavior when it occurred. The public’s attitudes diverge in similar ways on some of the more severe behaviors in the scenario. Most prominently, 85% of Americans think that Julie experiences online harassment when she begins to receive vulgar messages about her looks and sexual behavior. But substantially fewer (although still a majority at 66%) think that the social media platform has an obligation to step in and address that behavior. The vast majority of both men and women feel that Julie does in fact experience online harassment in this scenario. But at the same time, men and women respond somewhat differently to some of the specific elements of the scenario. Most notably, women are roughly three times as likely as men to consider it online harassment when Julie’s post is shared on social media by the blogger (24% vs. 9%), and they are also substantially more likely to consider it harassment when Julie first begins to receive unkind messages (50% vs. 35%). And although roughly eight-in-ten men consider it harassment when Julie receives vulgar messages, when she sees people editing her picture to include sexual imagery, and when she receives threatening messages, in each case that point of view is shared by roughly nine-in-ten women. In many ways, Americans’ views on this scenario mirror those in the previous scenario involving sexual harassment. Fully 85% of adults believe John experiences online harassment in this scenario, while 6% feel he does not face harassment, and 10% are unsure if this scenario involves online harassment or not. They also respond in largely similar ways when asked which specific elements of the story constitute harassment. 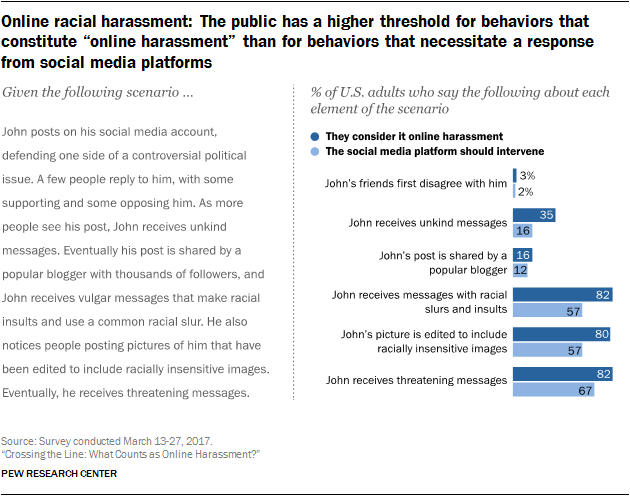 Very few Americans think that John’s initial social media argument constitutes online harassment, but sizable majorities agree that John experiences harassment when he receives vulgar messages with racially insulting language (82%), when his picture is edited to include racially insensitive images (80%), and when he receives personal threats (82%). And as with the case of the scenario involving sexual content, Americans have a somewhat different threshold for behavior that constitutes online harassment as opposed to behavior that deserves a response by the social media platform hosting that behavior. For instance, 80% of Americans think it constitutes online harassment when people begin posting pictures of John that include racially insensitive imagery, but 57% think that the social media service should have stepped in to address that behavior. 66% of Americans think the social media service should have stepped in when Julie receives vulgar messages that insult her looks and sexual behavior, but that share falls to 57% for the scenario where John receives vulgar messages involving racial slurs and insults. 71% think the platform should have stepped in when people post pictures of Julie online that included sexual images, but 57% feel that intervention is required when pictures of David are posted that include racially insensitive images. 76% think intervention is required when Julie begins to receive threatening messages, but that share falls to 67% in the scenario involving David.